Sony's cheap new handset will be available for a shade over £125 according to online retailer Clove. The new budget Xperio Miro was announced last month on Facebook, and offered a cut-down smartphone experience with an expected price to match. And while it hasn't quite reached the levels of the Huawei Ascend G300 (nor the specs), it's still a relatively decent buy at £126. Don't expect next-generation technology under the hood here though – it's only rocking an HVGA screen resolution (at 3.5-inch) and an 800MHz processor too. There is a 5MP camera with LED flash on board, plus Sony's xLoud audio enhancement giving you improved tunes as well. 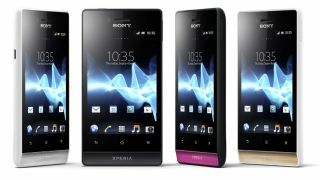 We've spoken to Sony and it confirmed that there's still no Xperia Miro release date on the cards at the moment - but unofficial sources have indicated it may be 'a little while yet' before the handset arrives. Given the current release window was pegged for Q3 this year, that does make us wonder if it may be more of a Christmas launch for the new phone… but we'll wait and see.